CHICKPEA | CHANNA KURMA - A healthy and delicious kurma that can be prepared with channa or chickpea. Channa Masala is an all time favorite and yes whenever we go to restaurant the first thing to order will be Channa Batura and now coming to this recipe this kurma looks rich and tastes great with chapathi's as well as poori. A slight twist from the channa masala would be the addition of coconut grinded with few ingredients .Now lets get started and see how to prepare this recipe. First step : Soak the channa overnight or for 8- 10 hrs. Second step : Pressure cook the channa | chickpea for about 6-8 whistles with little salt . The more we cook the channa,it becomes really soft. You can reduce the whistles if you want the channa to be little firm. Drain and reserve the water from the channa as it can be used in the gravy as well as while preparing the dough. Third step - Prepare the ginger - garlic paste , Chop the onions and tomato. In a jar add coconut along with cashews, green chillies and aniseed. Add sufficient water and grind it to smooth paste. Fifth step - Add the chopped tomatoes. Tip in the spice powders and mix them gently. Add little water, cover and cook until the raw smell of the masala goes off. Keep stirring to avoid them getting burnt. Sixth step - Add the Chickpeas in the pan . Add sufficient water along with salt (I used the reserved water from the cooked channa). Stir it gently and allow it to boil. Seventh step - Finally add the grounded coconut paste . Mix them well . Check for salt and allow it to boil for about 10 minutes. Remove from heat Garnish with coriander leaves. Delicious chickpea kurma is ready to be served. 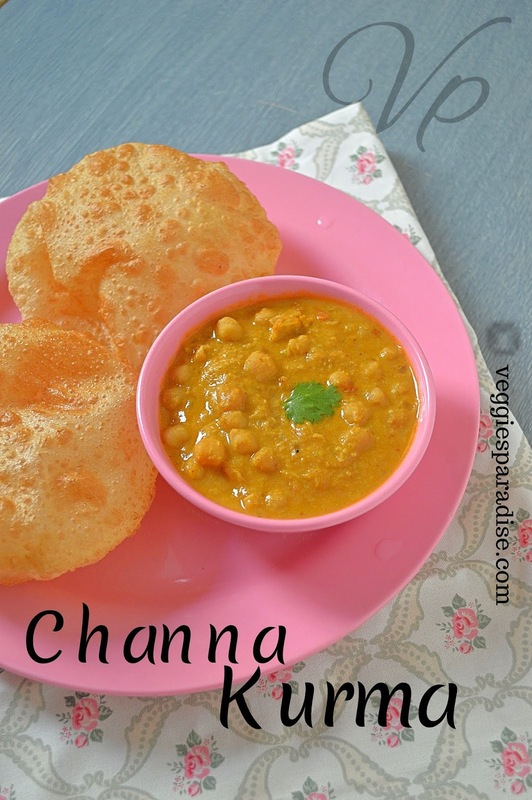 Check out the channa masala recipe and a beautiful sandwich that can be prepared with the leftover masala. 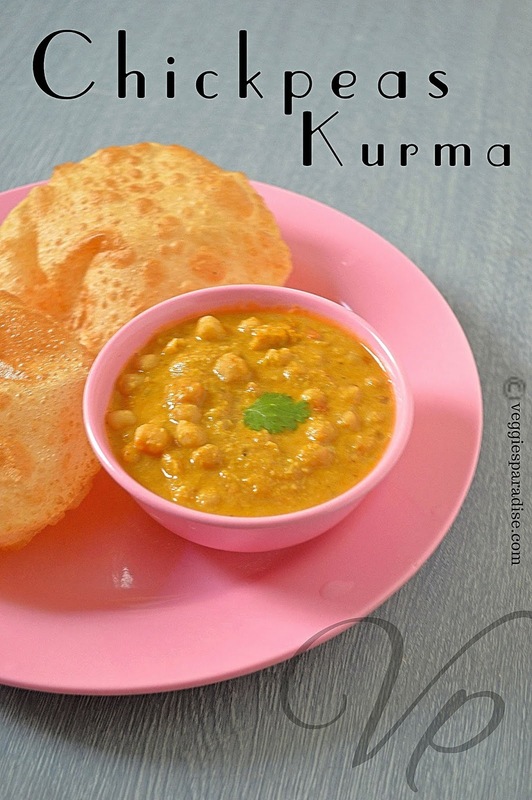 A rich and delicious kurma prepared with chickpea. Pressure cook the soaked channa for about 6-8 whistles. Heat oil in a pan, add all the ingredients mentioned to temper. Saute it for a while. Add the onions, fry them until they turn slightly brown. Add the ginger- garlic paste. Saute until its raw smell goes off. Add the tomatoes and tip in the spice powders. Mix it well . Add little water. Cover and cook until onions and tomatoes get cooked along with the masala's Make sure you give it a stir to avoid it getting a burnt. Add the Chickpeas to the pan . Add sufficient water (I used the water used to cook the channa). Add salt . Stir it gently and allow it to boil for about 10 mins. Finally add the grounded coconut paste . Mix them well, check for salt and allow it to boil for about 10 minutes. Remove from heat Garnish with coriander leaves.